More than just dental! Offer hearing, vision, telemedicine & wellness savings - and more! • More than just dental! Offer hearing, vision, telemedicine & wellness savings - and more! DentalPlans.com offers more than just dental savings! With more than 30 plan partners, consumers have unrivaled choice in selecting a program that offers the savings they need. Members save on dental, telemedicine, prescription, vision, hearing, chiropractic services and more. Save 10-60% on most dental procedures at thousands of dentists nationwide. Select plans include savings on orthodontics and cosmetic procedures. Vision savings plans allow members to save money on the vision care services they need. Services include routine eye exams, lenses and frames, contact lenses and even LASIK surgery. DentalPlans.com offers two standalone vision plans through the VSP and Coast to Coast Vision programs. Select Dental Savings Plans also include vision savings. The plans below include access to savings on hearing care services such as initial screenings, diagnostic testing, hearing products like hearing aids and more. Many of our plans include access to savings on prescription medications at thousands of participating retail pharmacies nationwide. Accessing these prescription savings is easy – members simply show their discount card at the pharmacy counter and receive the associated discount at time of purchase. With telemedicine, the doctor is always in! DentalPlans.com offers three plans that include telemedicine services to help members save on non-emergency doctor’s office, ER and Urgent Care visits. Select plans include additional health and wellness benefits like discounts on chiropractic services, massage therapy, tobacco cessation and more. savings for dental, telehealth, vision or Rx. Dental Savings Plans for groups provides an affordable alternative to group dental insurance. For a low annual or monthly fee, plan members get access to a nationwide network of more than 100,000 dentists who offer discounts on their standard rates to plan members. Typical savings range from 10%-60%. Unlike traditional dental insurance, there are no yearly caps (maximums), no restrictions on pre-existing conditions and many plans offer savings on braces and dental cosmetic services along with discounts on prescriptions, vision and hearing care. Telemedicine eliminates much of the cost, anxiety, and time-wasting annoyances associated with getting professional medical care for common conditions like allergies, rashes, colds and flu, sinus infections, and other easily diagnosed and treated illnesses. With a telemedicine service, instead of visiting a doctor the patient chats with the doctor via phone, a smartphone app or a computer/tablet. The patient can describe symptoms, share photos or use video chat to show the doctor any visible symptoms such as a rash. The doctor will then typically provide advice for treating the problem at home, and may phone a prescription into the pharmacy of your choice if medically applicable to the situation. 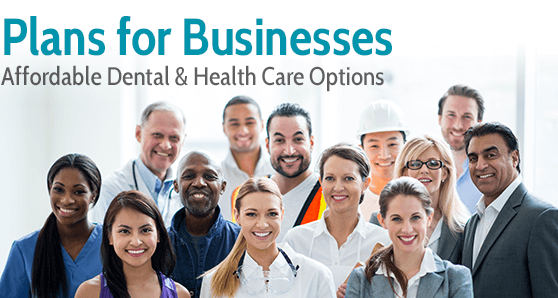 Complete the Contact Form to learn more about dental and healthcare savings for your group. Please complete the form to ensure an accurate quote. Sign me up for e-mail savings & updates!